Agdia's ArMV ImmunoStrip® is a rapid diagnostic test. 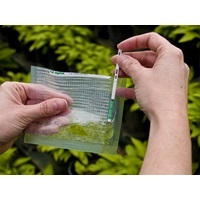 It is perfect for spot checking plants in the field and the greenhouse. The test should be used on leaf samples to achieve optimal results. The ArMV test is not yet applicable to seed or root tissue and grape testing. The test is proven to detect over 30 ArMV isolates. In a survey including 63 virus species, cross-reactivity was only observed with some Grapevine fleck virus (GFkV).